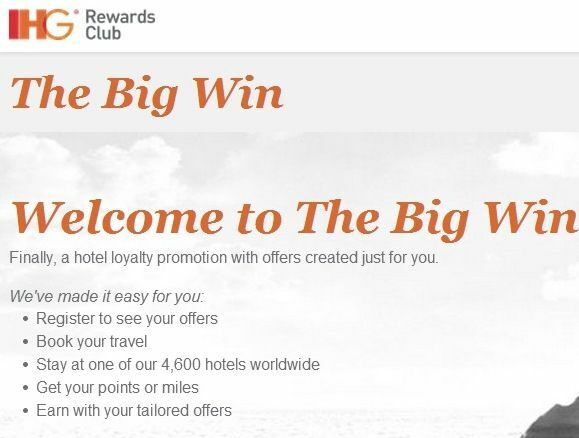 Last night I wrote that IHG Rewards (Priority Club)’s September through December promotion launches Monday. Except that the website to register and unveil your targeted offer is live early. My offer is for up to 72,100 points, what you’re offered may vary both in amount and in degree of difficulty. And while 72,100 sounds like a lot, scale matters here — these points, like Hilton HHonors points, are a bit ‘inflated’. This will not get you two free nights at the time participating hotels (and remember that the terms and conditions of the program exclude most elite benefits, hotels don’t have to give upgrades for instance, making the free nights themselves less valuable in my view). I’m a bit of a lapsed member of the program. I really only stay at one brand (Intercontinental) and have been a Royal Ambassador member since 2006 but haven’t been staying with them this year. Intercontinental has given me some of my very best upgrades and they have some of the better club lounges, though I don’t like not receiving upgrades, minibar, and early check-in benefits on award nights. And while Hyatt isn’t in all of the cities I need to travel to Intercontinental certainly isn’t. As a result some of my threshold levels are quite easy, I would imagine that some others have to stay at more brands to get the brand bonus though perhaps the point values are higher too — booking through their website on stays I’d make anyway is easy, 7 nights is easy, 2 Saturday night stays is easy to the extent the bonus pushed me to shift my business over to them for the promotion. I wouldn’t mattress run from scratch to earn these points (especially since you can buy Priority Club points at 7/10ths of a cent apiece), I would need a lower total cost including room rate and tax but also including transportation to and from each hotel and accounting for the opportunity cost of my time which is less than $71 per night in order to come out ahead. Still, since I can earn the full bonus in just seven nights this a pretty lucrative offer (an overage of about 10,000 bonus points per night) to consider for stays I will make anyway, and it would even make sense to do one final extra night that I didn’t need if that’s all it would take to close out the full promotion. You can join the 30,000+ people who see these deals and analysis every day — sign up to receive posts by email (just one e-mail per day) or subscribe to the RSS feed. It’s free. Don’t miss out!